Nigeria’s Under-20 female team the Falconets defeated Haiti 1-0 on Thursday to keep hope alive in their quest to move into the knockout stage at ongoing FIFA Under-20 Women’s World Cup in France. The match played at Stade de Marville in the French city of Saint-Malo saw team captain Rasheedat Ajibade netting the only goal of the match through a first half penalty kick. The victory which earned Nigeria the maximum three points started at a furious pace but neither side were able to put up any real goal-scoring threat. It took until the 36th minute to see the breakthrough, with Nigeria being awarded a penalty kick after Anam Imo was fouled in the area by Haiti’s Dougenie Joseph. Ajibade, who is Africa’s top scorer in qualifying for France 2018, made no mistake when presented with the opportunity and converted what turned out to be the winning goal from 12 yards. Haiti responded to going behind almost immediately but Nerilia Mondesir was denied by the post after a swift counter-attack. The Caribbean side continued to push for the equaliser but goalkeeper Chiamaka Nnadozie, who was later picked “Player of the Match’’, proved to be equal to every challenge that came her way. Mondesir and Melchie Dumonay took much of the initiative going forward, looking dangerous at times, but the Nigerian backline, marshalled by Nnadozie, held on for the victory. 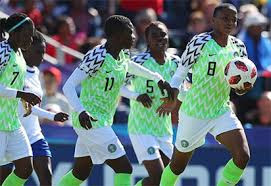 The News Agency of Nigeria (NAN) reports that the win pushed Nigeria up the group’s table from fourth place after Monday’s opening matches to second place after Thursday’s matches. Germany, 1-0 winners over Nigeria on Monday, remained firm as Group D leaders after beating China PR 2-0 in the group’s other MatchDay 2 fixture earlier at the same venue. Nigeria now need at least a draw in their final group phase match on Monday against China PR to be able to finish second and pick the group’s other quarter-final ticket. Germany face Haiti on Monday at Stade de la Rabine in Vannes in their final group phase game and look sure bets to emerge group leaders, even after a slim loss. The Falconets can be sure of emerging group runners-up with at least a draw against China PR at Clos Gastel Stadium in Lehon, at Dinan-Lehon, even if Haiti beat Germany.